International Relations (IR) as a discipline is often deemed to be “too Western” centric. It has been argued that much of mainstream IR theory is “simply an abstraction of Western history.” In this respect, many IR scholars have called for “broadening” the theoretical horizon of IR while problematising the Western parochialism of the discipline, and it is increasingly acknowledged that IR needs to embrace a wider range of histories, experiences, and theoretical perspectives, particularly those outside of the West. However, despite such a meaningful debate over broadening the theoretical and practical horizons of IR, several critical questions remain unclear and under-explored. For example, does IR need to embrace pluralism? If so, how much? To what extent, and in what sense, is IR parochial? Should IR promote dialogue across theoretical and spatial divides? If so, how? Yong-Soo Eun addresses these questions. He undertakes a literature review and an empirical analysis of the extent to which the field has actually become diverse and pluralistic. This investigation considers diversity beyond the current limited focus on the geographical origins of theory. Yong-Soo also draws attention to the mechanisms and processes of knowledge production and transmission in IR. More importantly, he addresses what is probably the most acute issue associated with the “non-Western” IR theory-building enterprise; namely, fragmentation and dialogue. In conclusion, Yong-Soo notes that the role of unsettling the present hierarchical structure of the discipline falls to reflexive individual agents. He argues that in order for their agential power to be more fully harnessed in the opening up of IR, critical “self”-reflection and “collective” empathy and collaboration among marginalised scholars are all essential. Chapter 3. Why is IR so Western/Positivist-Centric? Yong-Soo Eun is Associate Professor of Political Science and International Studies at Hanyang University (HYU), Seoul. Before joining HYU, he taught at the University of Warwick in the UK. He has published articles in scholarly journals, including Review of International Studies, International Studies Perspectives, and PS: Political Science and Politics. 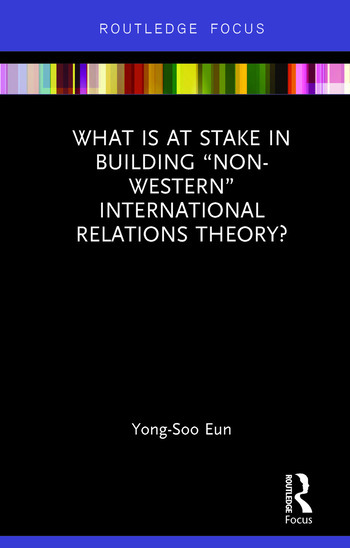 Yong-Soo is broadly interested in IR theory and the international politics of the Asia-Pacific region.